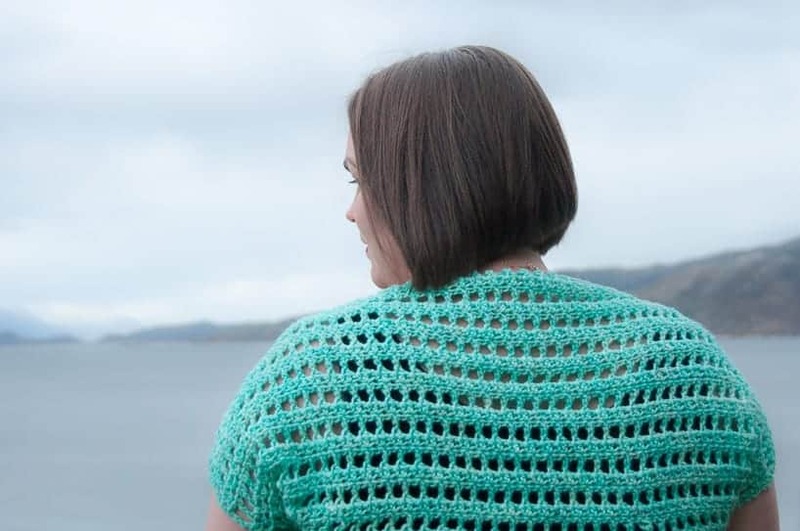 You’re going to love the crochet Callaina Tunisian Lace Bolero, because it’s a quick make. This is definitely what I would call a 1 day make. 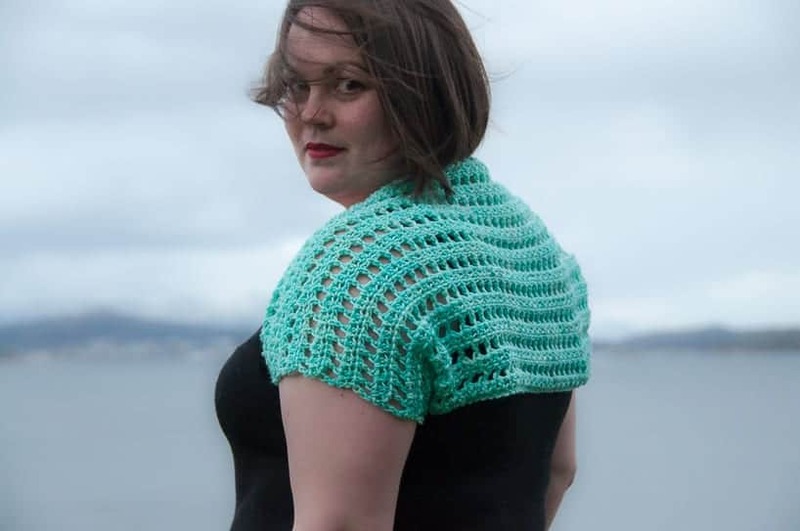 Crocheted boleros can be a great idea for Spring and Summer, because of the lovely stitch details you can make them with & also because they can cover your shoulders while still not being too warm. Personally I love using crocheted boleros together with summer dresses or even to a wedding. One of my favorite crocheted boleros from earlier is the Sunny Bolero, but the crochet Calllaina Tunisian Lace Bolero will definitely fight for the top spot. I received this yarn from Baad Mom yarns to write this yarn review, but as always, I never crochet without designing something new. 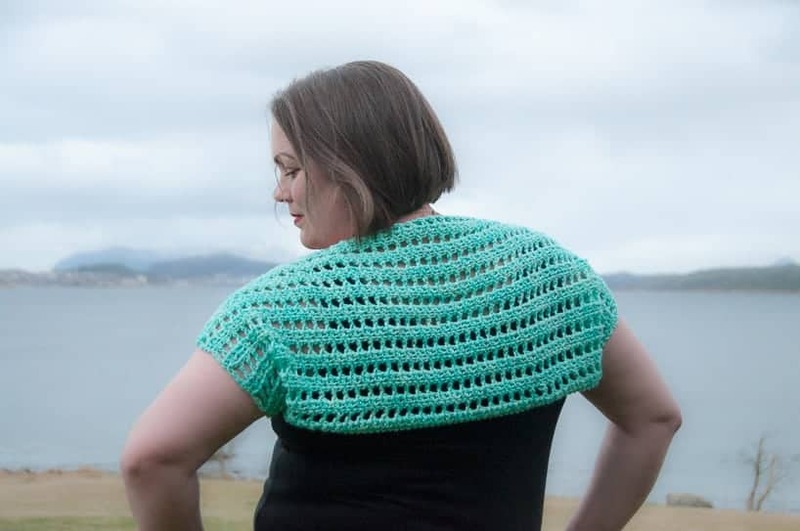 This bolero isn’t big & could be made even bigger if you prefer that, but I loved the idea of a smaller bolero & the bonus is that it’s a true one skein wonder. 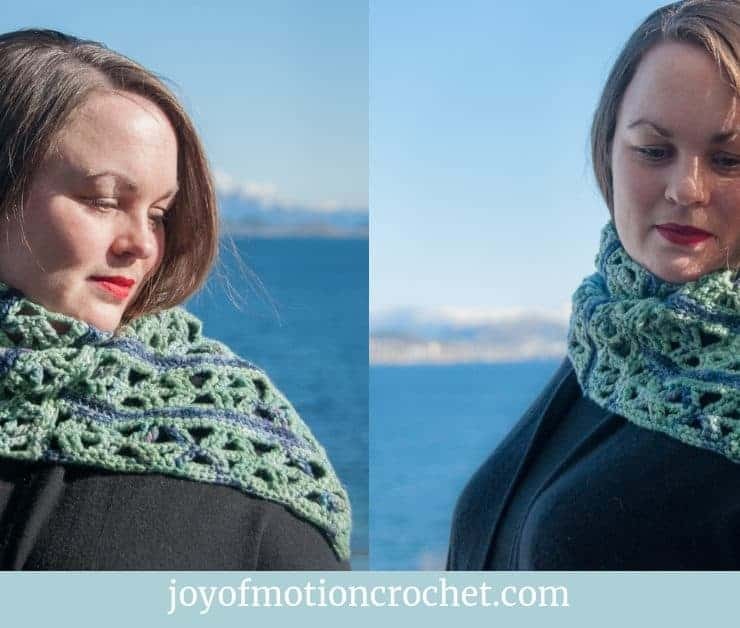 Finally, this is the first time I’m publishing a pattern featuring Tunisian crochet, I just recently learned it & I’m so excited about this new adventure! 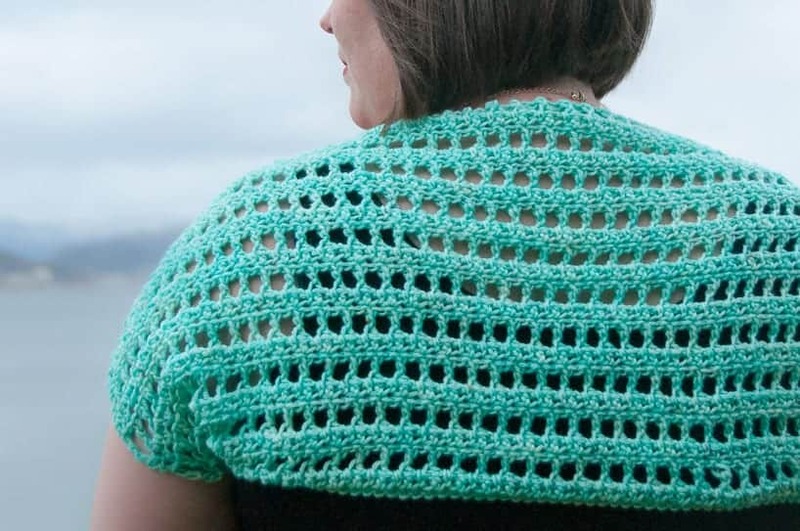 The yarn used for this crocheted bolero is a worsted weight, 100 % merino, hand dyed yarn from Baad Mom Yarns. You can read everything about it here. What I love about this yarn is the fact that it could withstand me ripping out & starting over multiple times while I made the design. The best thing, it didn’t show signs of it at all. Finally, the color! Love the turquoise & the tiny beautiful speckles. If you’re interested in this yarn, you can grab it with the coupon code below. It is valid until June 1st 2019. This Tunisian crochet bolero is absolutely perfect for Spring & Summer, because it’s such a great little piece to wear. It covers your shoulders beautifully & the lovely lace crochet stitch makes it look interesting & pretty at the same time. 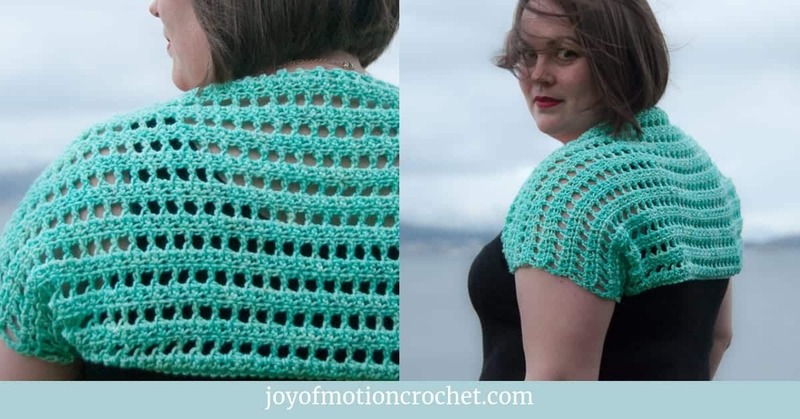 As mentioned, this crochet bolero could be made even bigger or smaller, just start the project with more or less stitches. 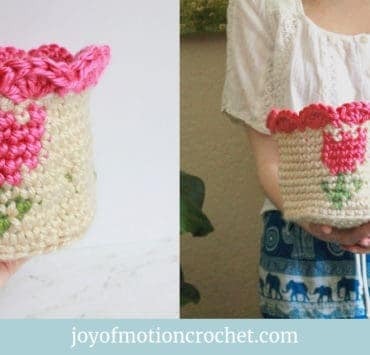 Next, this is a great project when you want to try Tunisian crochet, this is actually my first ever project using this technique. Since you like the crochet Callaina Tunisian Lace Bolero, these might interest you too? The crochet Callaina Tunisian Lace Bolero is a great project for Spring and Summer. 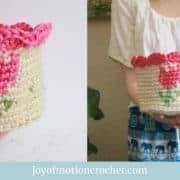 It’s a great project to try Tunisian crochet, because you’ll just make a rectangle, & don’t have to worry about complex increases or decreases. 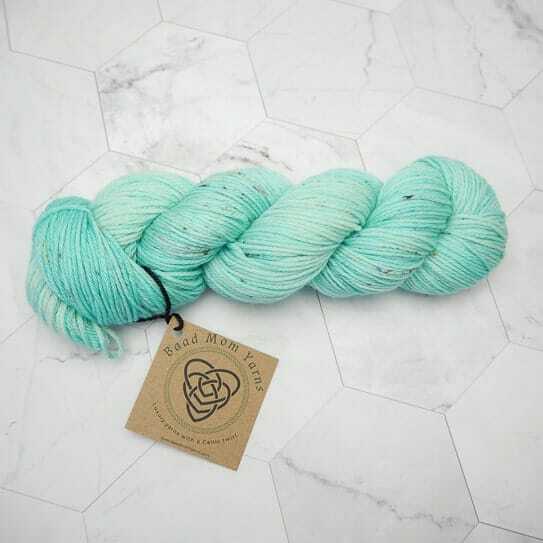 For this project you’re going to need 1 skein worsted weight hand dyed yarn, the one pictured is Baad Mom Yarns, Practical Mom. The bolero can be made both bigger & smaller by changing how many stitches you start with, making this a very adjustable project. with a 60 cm / approximately 24 inch wire. Baad Mom Yarns – Practical Mom. 14 stitches & 7 rows per 10 cm / 4”. Make the bolero wider or narrower by adding or reducing the number of stitches you cast on. Add or reduce by 2 stitches at a time. 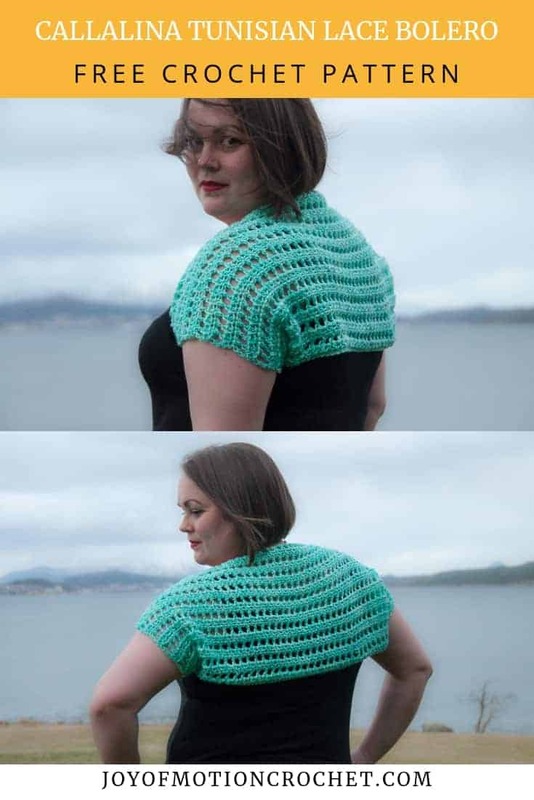 Make the bolero bigger or smaller in height by adding or reducing the number of rows you crochet. Yo, insert hook in next stitch, yo and pull up a loop, yo, pull through 2. Each time you repeat, you’ll add 1 extra loop on the hook. Yo, insert hook into the next 2 front vertical bars, yo and pull up a loop, yo, pull through 2. Cast on stitches onto your Tunisian hook using the method as shown here. Yo, pull through 1, *yo, pull through 2*, repeat from *to* until you have 1 loop on the hook. WHERE IS THE FRONT VERTICAL BAR? After crocheting the first return pass, you should be able to see distinct vertical bars. One in the front of the work (the front vertical bar) & one in the back (the back vertical bar). Cast on 94 stitches on your Tunisian hook. Ch 94 stitches & do the standard Tunisian return. 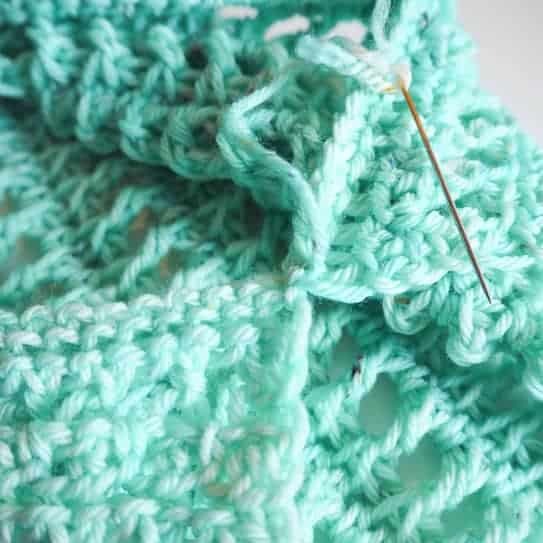 *Always start the first stitch on each row in the second front vertical bar. All stitches are made in the front vertical bar of the stitch, except the final row. Row 1: Ch 1, Tdc 1 in each st across, return (=94 st). Row 2: Ch 1, *Tdc2tog in the next 2 st, yo*, repeat from *to* until you have 1 st left, Tdc 1 in last st, return (= 94 st (1 ch, 46 Tdc2tog, 46 yo, 1 Tdc)). Repeat row 1 & 2 until you have crocheted 20 rows. Row 21: Ch 1 (counts as 1st st), sl st 1 between each st across to make the upper edge even. 1. To turn your rectangle into a bolero, fold the bolero double folding the shorter edges & seam the corners from the same short edge together. 2. Fasten threads & weave in ends. I really hope you liked the Crochet Callaina Tunisian Lace Bolero! 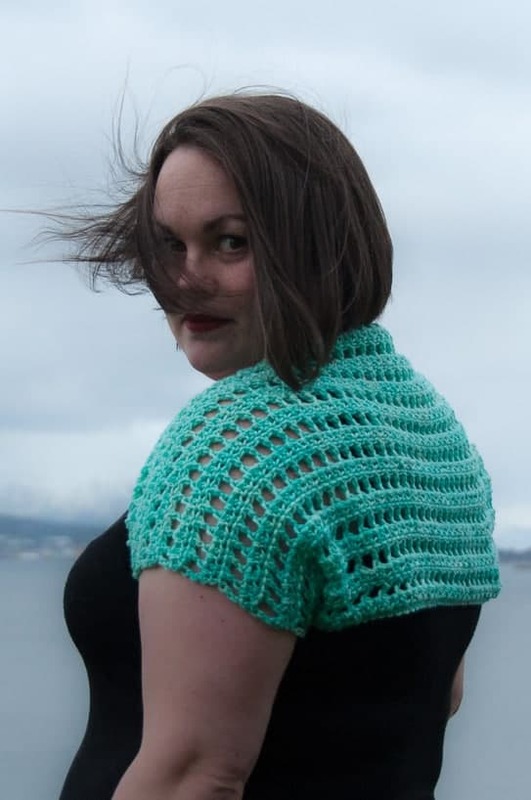 However, if you really like it, make sure to share the FREE pattern & share pictures of your Crochet Callaina Tunisian Lace Bolero that you’ve made with me. Share your finished Crochet Callaina Tunisian Lace Bolero on Love Crochet. 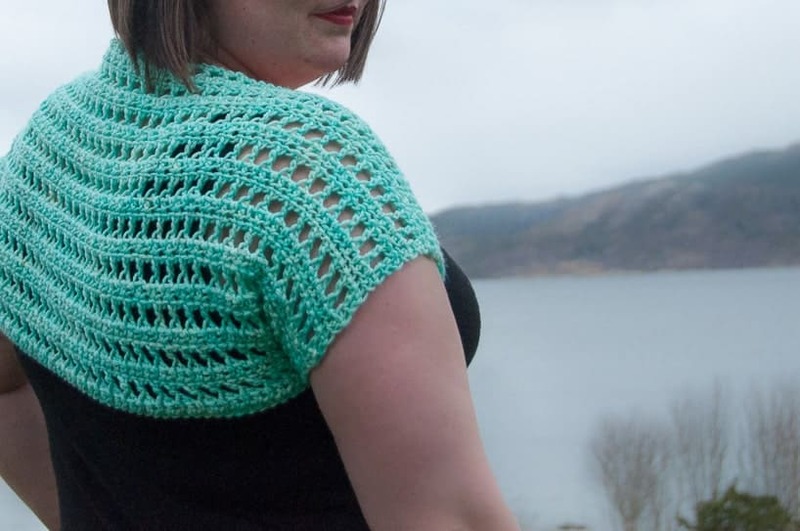 Share your finished Crochet Callaina Tunisian Lace Bolero on Ravelry.